Changing your kitty’s cat litter tray is one of the more unpleasant tasks associated with owning a cat. The more cats you have, the bigger the task it is. Any product that makes your task easier is going to be very welcome. Cat litter has been around for years and there have been many changes since it was first invented. The old clay cat litters were dusty and cats tracked them all over the house. Modern products are practically dust-free and do not track so readily. You have several options when it comes to cat litter. You may prefer clumping litter to make cleaning easier or you may prefer an environmentally friendly product that is derived from plants. Don’t forget that your kitty will have their own opinions too! To help you with your decision, here’s our pick of the best cat litter for your cat. This is a completely natural cat litter made from clay. The granules are medium grain and non-tracking to limit the sweeping up that you have to do. It clumps extremely well and gathers the moisture so it does not reach the bottom of the litter tray and makes cleaning it out a lot easier. It will work very well with regular, sifting and mechanical litter boxes and is practically dust-free. The litter is excellent at sealing in odors and always smells fresh but does this without using artificial perfumes or deodorants. It is hypoallergenic and contains no plant proteins. This is a completely dust-free cat litter that will rid your home of litter tray odors within seven days. 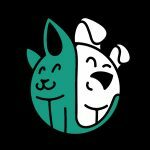 Thanks to the unique formulation that includes odor eliminators, fresh scent and baking soda, your cat’s litter tray will soon smell clean and fresh. The moisture-activated micro-granules are derived from plants and form a seal around the pee and poop which prevents moisture leaking out and keeps in the odor. Because the clumps that if forms are solid, they are easy to scoop out of the litter tray. All you have to do is top it up with fresh litter and then completely change it once a month. This cat litter is based on a natural clay product with an added deodorizing system that locks in the ammonia smell of urine and the unpleasant smell of feces and keeps your home smelling fresh. It is 99.99 per cent dust free. When it comes into contact with moisture, it forms firm clumps that can easily be removed from the litter box with a scoop. Thanks to the long-lasting odor control, there will be no smell even after multiple visits to the litter tray. This makes it an ideal product for homes with more than one kitty. A natural and environmentally friendly product, this cat litter is made from whole-kernel corn and so it is totally renewable and sustainable. It is lightweight and dust free and is therefore completely safe for your pet. It offers outstanding odor control and quickly forms clumps when your cat uses the litter tray. These clumps are easy to remove and can be flushed down the toilet as they are septic tank safe. However, always check with the authorities in your area because in some States you are encouraged to dispose of cat litter in the garbage and you cannot flush it. This is suitable for cats (and owners) that are sensitive to fragrances in cat litters because it contains no fragrance additives. It also does not contain any dyes that can cause irritation. Instead, it relies on the impressive absorbent abilities of baking soda and clay to capture the odors and seal them in, keeping your home fresh. It also locks in the moisture to form rock-solid clumps that are easy to remove. It’s 99 per cent dust free and does not track out of the box. This is an ideal product for households with more than one cat. A cat litter that is produced in the US from walnut shells and provides a completely natural litter tray solution. It is 100 per cent renewable and all of the walnuts used in its production are grown in the US. The litter is totally biodegradable if it is composted. It contains no artificial additives that could cause irritation to a cat or to you, the owner, and does not stick to your cat’s paws. It is dust-free and almost three times as absorbent as clay. The litter forms firm clumps and has exceptional odor control. This is a hypoallergenic clay cat litter that will suit homes with several cats. The litter granules can lock in odors for ten days. It is practically dust-free and forms firm clumps when exposed to moisture. This makes the litter tray very easy to clean out. This product is much lighter than many other brands so it’s easier to transport and store. It contains no scents and will not get tracked around your home. If you are looking for a cat litter that will not get tracked around your home and that is gentle on paws, this will be the one for you. It is a pellet cat litter that is made from recycled paper, cardboard and wood shaving so it is kind to the environment and your kitty. There are absolutely no harmful chemicals or toxins so it is a safe choice even if your cat accidentally ingests it. This is a non-clumping cat litter that effectively seals in moisture and prevents odors from escaping from the cat litter tray. 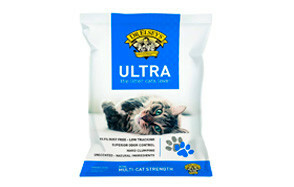 It may take a while to transition your cat to this product if they are used to a granule-based cat litter. A natural wood-based product that contains no additives or scents that could be harmful or irritating to your cat. It is also kind to the environment because it is made entirely from reclaimed timber that is already fallen or from lumbar materials that are unused. It is extremely lightweight and comes in a box with a handle and a pouring spout. The natural wood material seals in odors for up to seven days and has a naturally fresh fragrance. When your kitty uses the tray, the cat litter forms clumps which are easy to remove. It can absorb 500 per cent of its own weight in moisture. Then, all you have to do is top it up. It is both biodegradable and flushable. 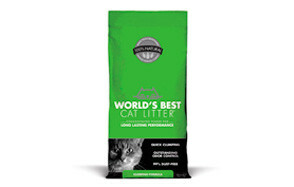 A high-quality clumping litter that is suitable for litter boxes used by several cats. It is supplied in handy packs that have a pouring spout and that can be re-sealed. Unpleasant odors are eliminated thanks to the power of Febreze freshness which gives the litter a pleasant fragrance. It is released whenever your kitty walks on the litter. Bacterial growth is inhibited and odors are sealed in for up to ten days. It has a low dust formula and due to the ‘Clumplock’ technology it can lock-in liquids, forming firm clumps of litter that can be removed easily. Don’t make the mistake of thinking that all cat litters are the same! Although it is likely that your kitty has the final say, you may also want to make decisions about what you feel are important features. Here are some of the things that you may want to look out for in the best cat litter. Cat litter can be made from clay, silica or plant-based material. They are all absorbent and all have some odor control. The choice comes down to personal preference. It is also up to your cat. Cats will make up their own mind based on whether they like the feel of the litter under their paws and on whether they like the odor of it. If you want an environmentally-friendly product, you will probably opt for one of the plant-based litters. Some are made from recycled paper but others are made from things like walnuts. These products are sustainable and do not damage the environment. Some cat litters form clumps when they come into contact with moisture but others do not. Some cats and their owners prefer clumping litters. It is easy to remove solid clumps with a scoop. Then you top up the litter. It cuts down the frequency with which you have to clear out the whole litter tray. Some cat litters have fragrances added. This helps to mask the smell of cat urine which can be very unpleasant. However, some cats do not like the smell and can be put off using the tray. Others are even allergic to artificial scents so this is something to watch out for. It’s no fun having to sweep up cat litter from all over your house. Litters that are non-tracking do not get stuck in between your cat’s feet and will not get transported out of the litter tray! This means less work for you. Cat urine has a pungent smell and it spreads throughout a home. Look for a cat litter that has exceptional odor control so that your house will stay smelling fresh. Natural products that capture odors (like baking soda) are preferable to artificial scents which merely mask the smell. Some of the older cat litters were very dusty and this was not good for the cats or the owners who could breathe in the fine dust. It also caused a mess around the litter tray. Many modern cat litters are described as 99 per cent dust free. Think about how you will dispose of the cat litter. Some are described as flushable, and this may seem like a convenient option, but they must be septic safe or they could cause problems. Also, check with the authorities in your area. Some States do not recommend that cat litter is flushed at all. When it comes to disposing of cat litter, the biodegradable litters are the most environmentally-friendly. They will break down naturally in landfills. The three broad categories of cat litter are clay, silica and plant material. Within each of these categories, there are many variations. Clay was the original material used in the first commercially available cat litters and is still very popular. It can absorb its own weight in cat pee and naturally reduces odor. This only lasts for so long and it will eventually become saturated and will start to smell. Some manufacturers add things like baking soda or charcoal to help with odor control. Some clay litters do not clump so you will need to change them often. Others have a special type of clay called bentonite added to them and this clumps when it comes into contact with moisture. All you have to do is remove the clumps with a scoop and top it up with more litter. The whole tray needs to be cleaned out around once a month. Silica gel can be used to make crystallized cat litters. This material is highly absorbent and controls odors. On the whole, they do not produce as much dust as clay cat litters but they are toxic. This is a problem if the silica is ingested by cats or other household pets. Biodegradable cat litters are a good option for cat owners that want to protect the natural environment. They can be made from recycled paper or from plant products such as pine, wheat, corn and walnuts. They will break down naturally and quickly in landfills. Clumping and Non-Clumping: Which is Better? Cat litters have plenty of features that you may or may not like. One of these is the ability to form clumps. Not all cat litters do this and, as always, there are advantages and disadvantages to this feature. Before you make a decision about what would suit you, here are the main pros and cons of each. Cat litter that does not form clumps can be made from clay or from plant-based materials such as pine, corn or wood. It tends to be less expensive than clumping litter and some cats prefer the texture. It is very good at removing odors from cat urine and is very absorbent. Many are unscented but have additives to help control odors including baking soda or charcoal. The disadvantage is that it can become saturated and urine can pool in the bottom of the litter box which makes it hard to clean out. Often, the whole litter box needs cleaning out at least once a week. As the name suggests, clumping cat litter forms clumps around the pee and poop that are deposited into the box. This means that the soiled litter is very easy to remove with a scoop and you don’t have to clean out the whole box so often. The most commonly used ‘clumping’ material is bentonite which forms a very solid clump but some natural fibers will do the same. Once the clumps have been removed from the litter tray, you simply have to top it up with fresh litter. Then, around once a month, you need to clean out the entire litter tray. Therefore, the choice is up to you. Some owners prefer the convenience of clumping cat litter whereas other owners are happier with non-clumping. Of course, your kitty will also have their own opinions! Some cats prefer clumping litter as they find it easier to move around whereas others prefer the non-clumping varieties. You can get the most out of your cat litter by knowing how to use it correctly. Here are five top tips for using cat litter. Get a cat litter that your cat likes. Cats have their own preferences when it comes to cat litter. It’s best to go with your cat’s preferences or they may end up rejecting the litter tray altogether. Transition carefully. Don’t make a sudden switch from one cat litter to another. Mix a small amount of the new litter with the old one and then gradually increase the proportion until you are using only the new litter. This will increase the chances of your cat accepting the change. Cut down on tracking. It can be a nuisance when cat litter gets tracked all over the house. You can reduce this problem by selecting a litter that does not track and by placing a mat in front of the litter tray so that your cat has to walk over it. Clean it out often. Cat litters can help to control odor but they can only do so much. You have to remove soiled litter regularly and clean the whole thing out at least once a month. Be very careful with hygiene. You can pick up diseases from cat feces including toxoplasmosis and salmonella. Dispose of cat poop very carefully and wash your hands very thoroughly, with soap, afterward. How to Get Rid of Cat Litter Box Odor? Cat urine is not a smell that you want in your home! The main reason that your cat’s litter tray smells of cat pee is because it needs cleaning out but there are some other things that you can do to keep it smelling fresh. Buy a clumping cat litter. This encourages you to keep the tray clean because you only have to remove the clumps. A complete litter change is only needed once a month or so. Buy a very absorbent cat litter. Cat urine sloshing around the base of the litter tray is never going to smell great! Don’t let that happen. Buy a super-absorbent cat litter that will lock in the moisture. Buy scented cat litter. This will do a good job of masking the litter smell but not all cats like it. Some can have allergic reactions to scents and fragrances so be on the lookout for this. Buy a suitable scoop. When you scoop out the clumps, you don’t want to leave any soiled granules behind because as these will retain a smell of urine. Therefore, use a scoop that has small and closely set holes, so that all of the granules will be removed. Add some baking soda. This is a natural odor-remover that will not irritate your cat. When you have added fresh litter, sprinkle some baking soda and mix it in. Give the box a good clean out. Once a month (or perhaps more frequently), the entire contents of the litter box need to be dumped. Soak the box in hot water for a while to give it a good clean. You can add some liquid dish washing soap if you need to clean away any dirt but harsh cleaning chemicals and disinfectants are not needed. Vinegar is also a good option. Never use any cleaning products that contain ammonia or bleach. Dry the box thoroughly. This is best done with a paper towel. Then sprinkle the bottom with baking soda to absorb any odors. Avoid adding scents. You may be tempted to add perfumes to the litter tray but these can be toxic for cats and can end up putting them off. If your cat is peeing outside the litter tray, it is going to smell even worse! Get two litter trays. If you have more than one cat, it may help if you use multiple litter trays. 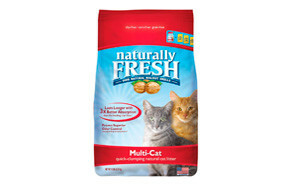 A natural, clay cat litter that has a medium-sized grain and that will not track. It forms clumps and seals in moisture before it reaches the bottom of the litter tray. It is dust-free and will work in sifting and mechanical litter boxes too. Odors are sealed in but it contains no artificial scents that may irritate you or your cat. It is hypoallergenic and completely safe.